Now you can make your own present paper wrap! 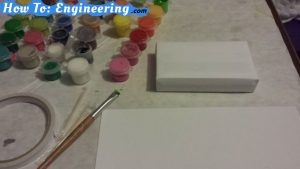 all you need is paper and paints and time! it was a tiny boxed present for my husband! He had a hard time ripping the nicely decorated paper. 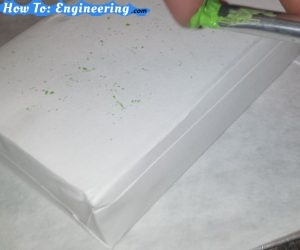 Start by wrapping a present with any type of paper that won’t let paint pass through and ruin your gift. You can use any of the following: white sheet of paper, newspaper, tissue paper, construction paper or even the same gift box. The result will give a balance on the paper and paint. 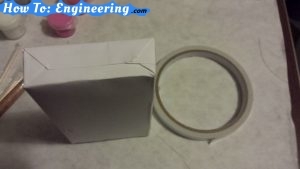 Use double side tape, which can be found at a local 99 cent store. You can also use rolled up scotch tape. 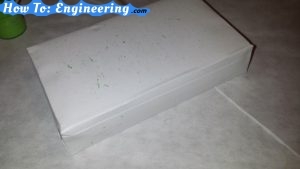 The main reason is to have folded edges with no tape exposed so the paint adheres nicer to the edges of the paper. 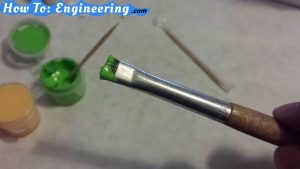 Using a toothpick, mix the paint well. 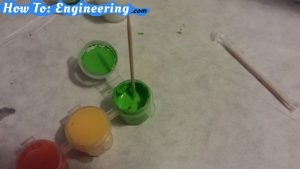 The paint and liquid separate after a while of not using, so make sure to mix. Now load the paint brush with more paint than usual and prepare to splatter! Also make sure to cover your working table it will get a bit messy. After placing the gift on the table and loading your brush with paint, rub the end the brush upwards but facing the wrapped gift. It will take a while to get the splattering action to take place. Practice makes perfect. This is the first splatter result, it was not much so lets make some changes. Make sure to have a variety of brushes and play around if your splatter is not how you wanted it. 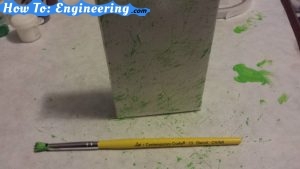 The longer and stiffer the bristles are the bigger the splatter. The first brush did not give the effect needed. It does not matter if you even practice on the actual gift wrap. 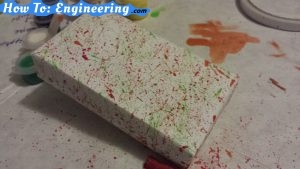 When you find the right splatter technique it will over take the previous. But you can always practice on a paper and then go to work on the actual gift wrap. 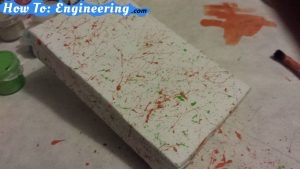 Keep splattering with different colors and stop as soon as you see enough coverage. Is up to you to make a nice combination or even add more colors or anything else you want. To finish off add a nice bow and surely it would be hard to undo the nice wrapping.